I am so excited to be an official Evite Influencer! I am compensated as part of the program. All opinions are 100% my own and I’m thrilled because I love evite and use it all the time, it is a busy parents friend. 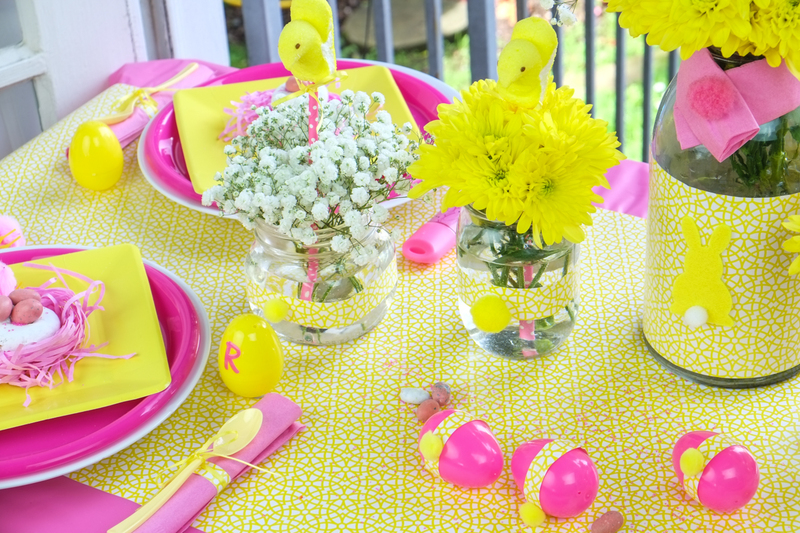 Our first challenge was to create an Easter table for under $35. 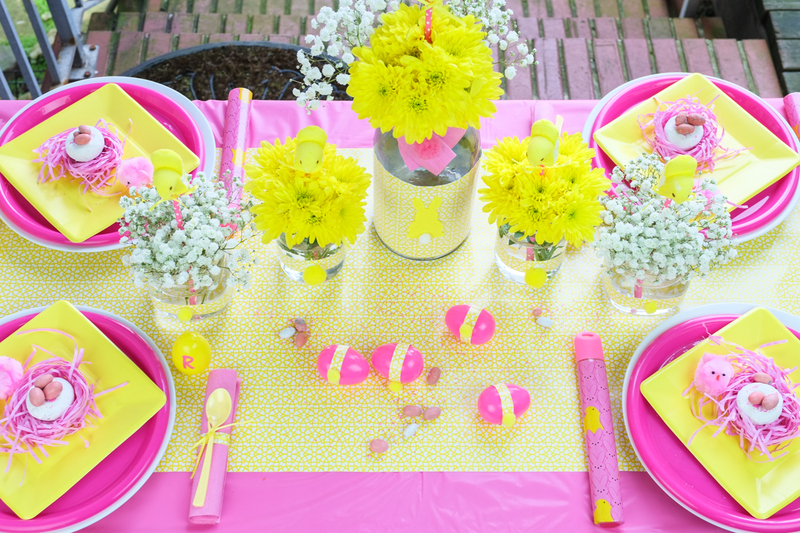 This bright pink and yellow peeps party was perfect for my little girl Parker (4) and her 3 favorite peeps! 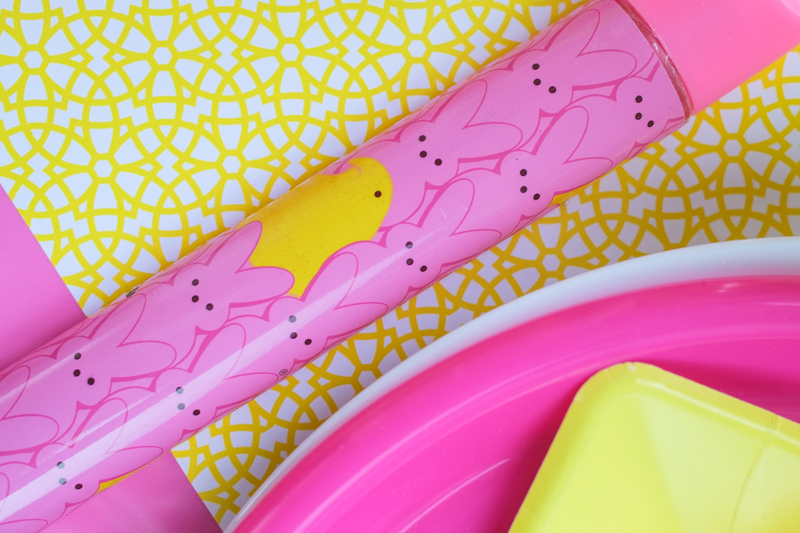 It was also perfect timing because not only does Parker love Easter (I suspect this has something to do with her ridiculously oversized SWEET TOOTH!) but she also recently had her birthday party so has not stopped asking for another party ever since! (or assuming other birthday parties are all about her too I might add!). 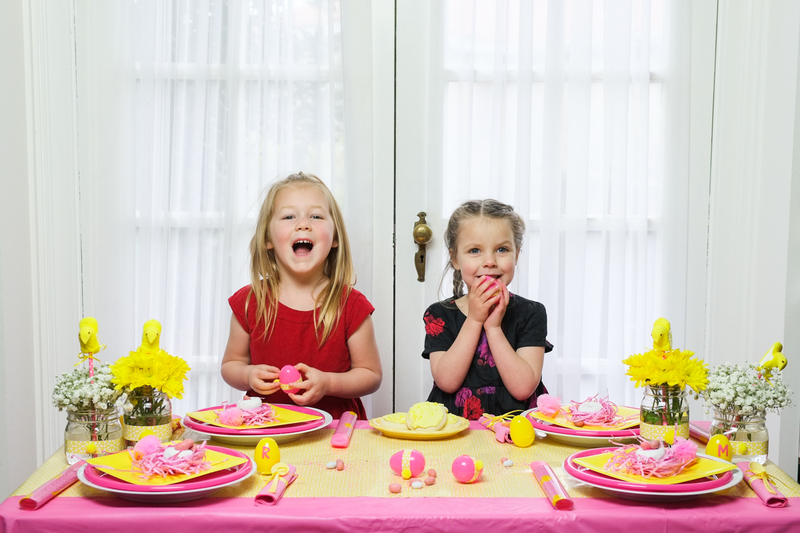 Now that she has that head tilt thing going on, how is a mom to resist throwing an Easter party?! I decided to let her help me with the planning, she loves to “help”, her teachers call it “natural leadership” lol. So we both went into evite to choose her invitation, it is my go-to for children’s party invites and tracking, it does the remembering for me, lol. I love to keep everything “in theme” and the invitation is always my starting point. Parker was so cute pointing at all the invites she liked, with a running commentary on why of course! 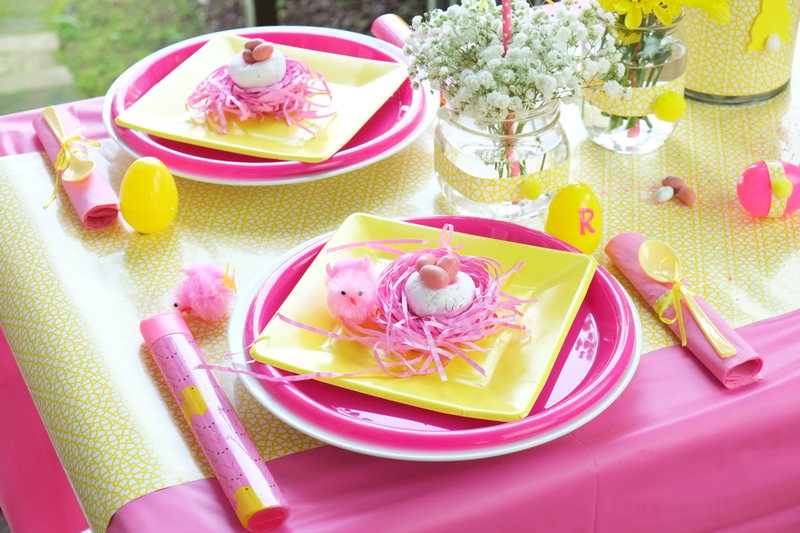 In the end she could not go past the pink & yellow “party with my peeps” invite; her favorite colors (together!) and baby chicks….awww toddler swoon! The colors POP! 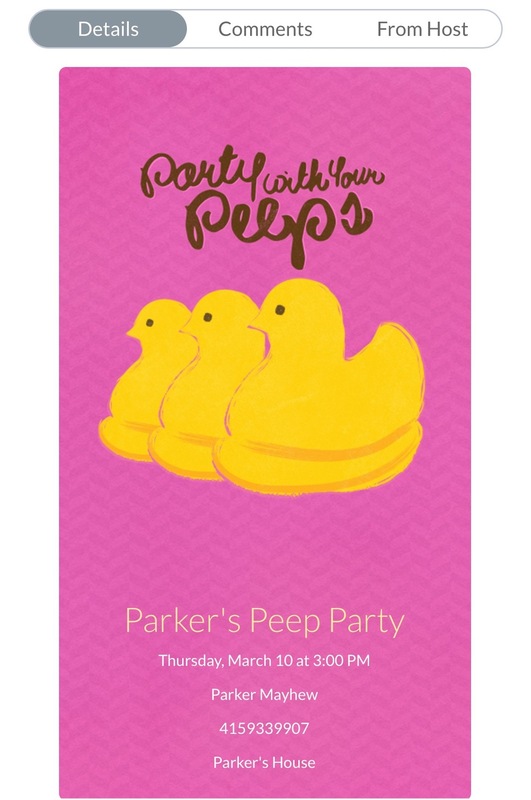 and I think the alliteration “Parker’s Peep Party” is super cute so mom is happy with this invitation selection too, a great theme! As I mentioned we have just freshly come off Parker’s birthday party and have a few more parties coming up. So the challenge to make something super cute that didn’t cost me to much was right up my alley! I was able to stick to a budget of $35 for table décor for four guests and still include edibles, a custom table runner, fresh flower centerpieces and party favors. I did this by shopping my favorite discount retailers and our local supermarket as well as a bit of creative decorating. Here is how I went about shopping the theme. I’ve also added a shopping list at the end of the post! 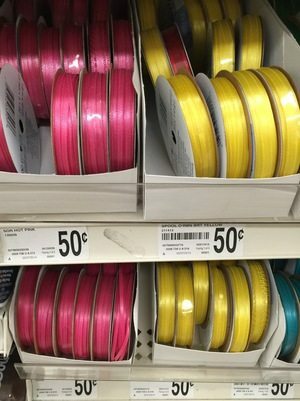 First I started with the colors – pink and yellow, pink, as the darker color would be the base (the table cover) and then I’d use yellow as the highlight (the table runner, ribbons & cutlery). 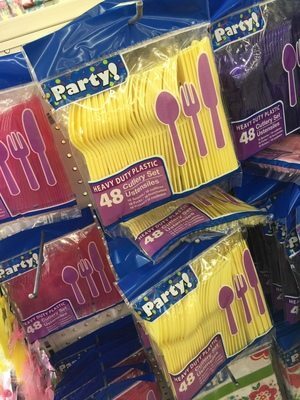 So off we went to buy a pink table cloth (plastic disposable), napkins (paper), straws (paper) and plates (paper) and a yellow table runner (paper), plates (paper) and cutlery (plastic disposable). 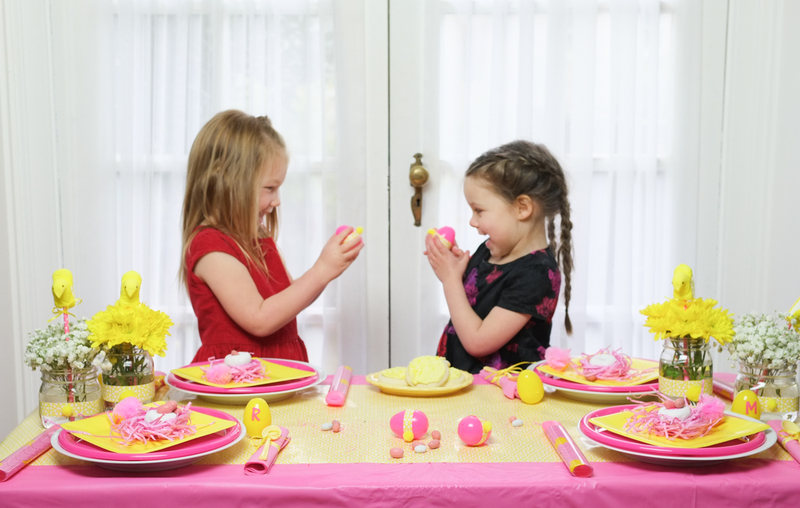 In most stores at the moment the Easter items are very close together and also (in many stores) decorative items are sold in color groupings – so the shopping process for specific colors was relatively easy, even with a 4 year old in tow! And even better, with exception of the runner, all $1 each. I love to use either wrapping paper or a paper adhesive for the runner on a children’s table. Its CHEAP (under $3), disposable, they can draw on it if they feel inclined (usually!) and it comes in really pretty designs and colors. Parker & I picked up a lovely yellow and white design that worked perfectly with the theme. Now the extras! A cute place setting, favors and flowers. 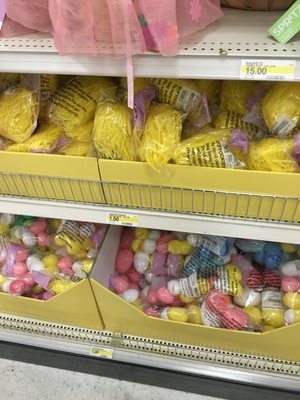 Easter straw is a great décor item at this time of year. It gives nice texture and height as well as fitting in with the chicks theme so I grabbed a small pile of this. 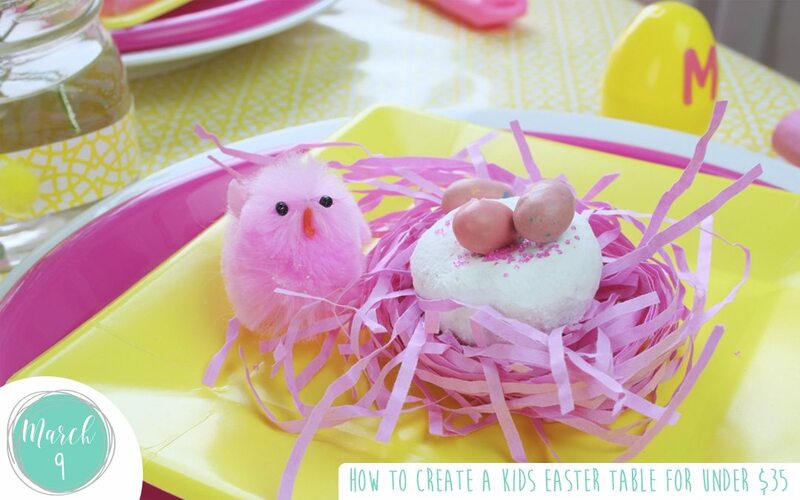 We also grabbed some ribbon, plastic Easter eggs, mini pink fluffy chicks, alphabet stickers to mark seating (not sure how yet but much better than my writing!) 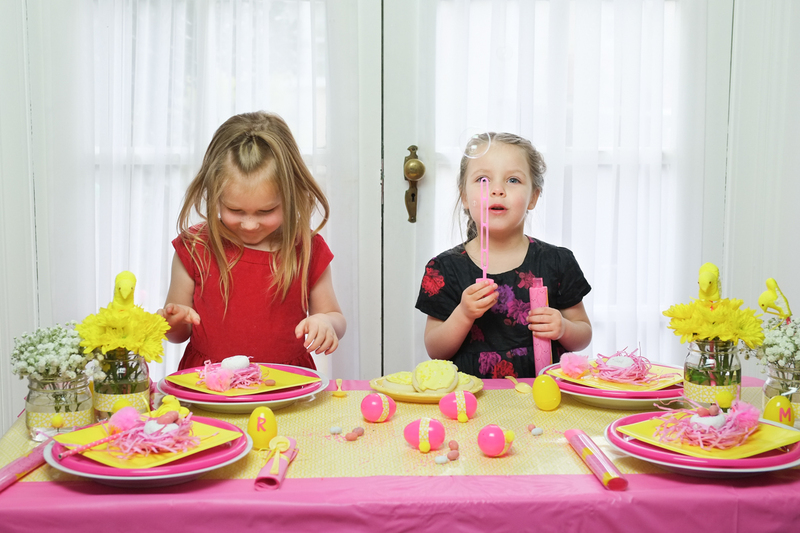 and some stick on bunnies & pom-poms (not chick or peep related but Parker loved the cottontails). 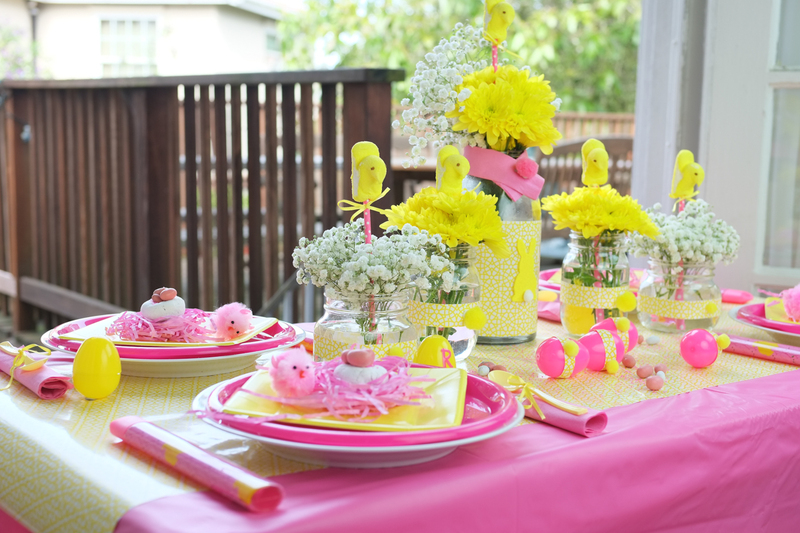 All of these items shout Easter and the kids love them so I thought they would be a great addition to the table. We then popped into the supermarket for delicious sweet treats; PEEPS! 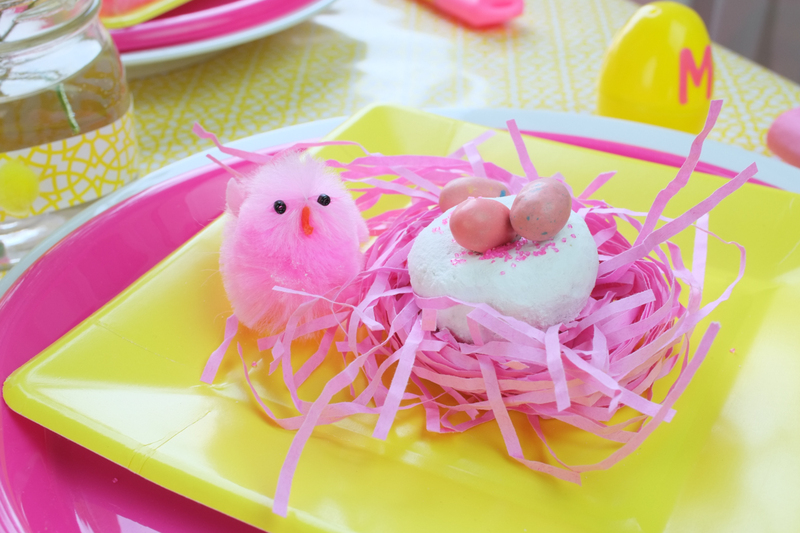 of course as well as mini white donuts and mini chocolate eggs – the combo just felt like a nest in the making. While in there we picked up a bouquet of yellow flowers with white babies breath, only $5.99! 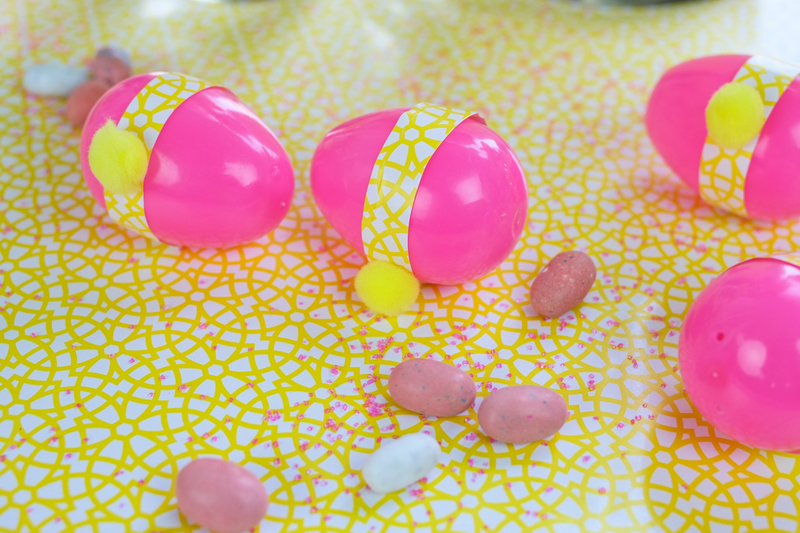 Parker also spotted peeps bubbles next to the Peeps in the colors we were using. She loved bubbles and was very proud to have contributed, 4 bubbles for $4. Favors done! We already had mac & cheese and juice boxes at home so we were good to go for a simple kids late lunch. Back at home – time to set-up. Table cloth first, then the runner. As the wrapping paper runner had white in it I decided to take 4 of my plain white dinner set plates and use them as chargers. This bought the white into the place setting and also gave a break between the pink of the larger plate and the table cover. Next the plates and then on top of the plates I used the straw to hold a donut with the chocolate eggs inside…the girls LOVED this little chick nest on their plates. The napkins I rolled and used a strip of leftover wrapping paper as a napkin ring and the ribbon to tie on the spoon for mac & cheese. I then used the stickers on the eggs to identify each girls seat, even a 4 year old likes a monogram. To display the flowers I hunted around the house for left over jam, pasta jars and mason jars. I always seem to have a stash of these. Alternatively you could use your own vases, drinking glasses or even tin cans, they would all work well. I then took more of the left over wrapping paper and cut it into strips which I taped around the jars. Add a pom pom bunny tail and I had a cute set of vases for the girls. On the central vase I also added a pink napkin and bunny tail around the top to bring the pink from the theme into the flowers. In went the flowers with one last surprise for the girls. 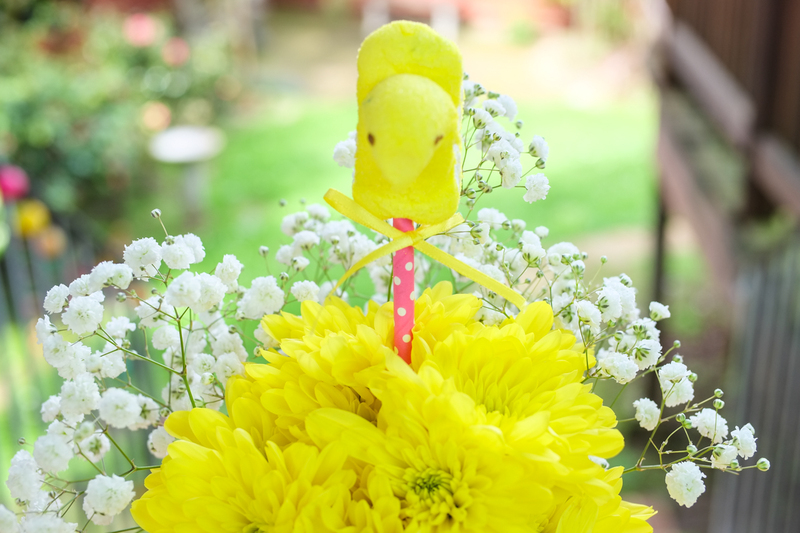 I had made them peep pops – taking the peep and sticking a pink straw into it (a little ribbon bow under the peep)..I put these into each flower arrangement for another splash of color and of course to amuse the girls. 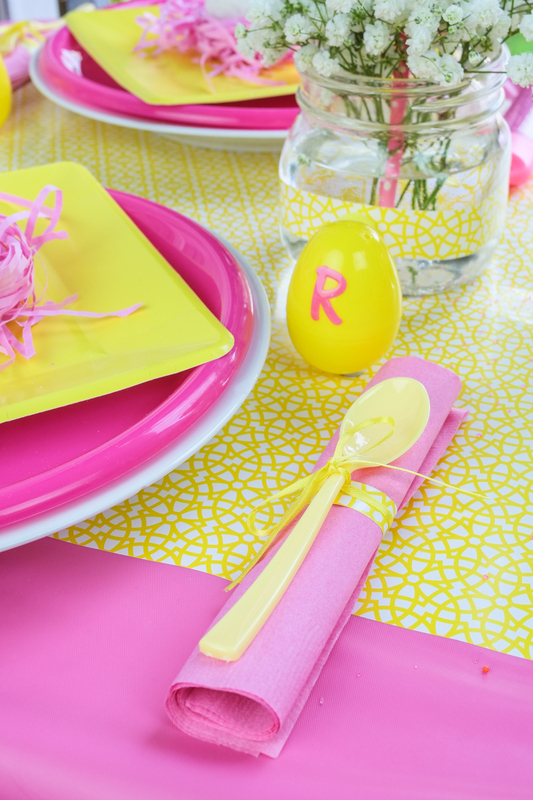 The finishing touches – favors to the side of the plates (and a scattering of plastic and chocolate eggs over the table. On the plastic eggs I used the wrapping paper and bunny tails again around the center to bring the color theme together. Shopping List (Décor – $28.20) – Don’t forget to use any coupons you have to cut costs further! 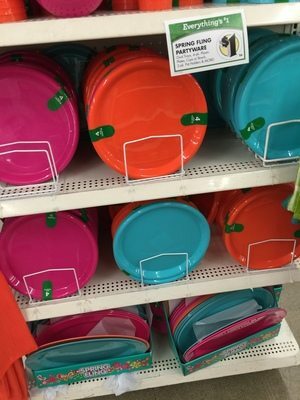 Of course, you can customize this party to colors you prefer or change patterns, types of vases or plates. So many possibilities await. Evite is a great place to start for inspiration, take a look at their gallery of invitations. 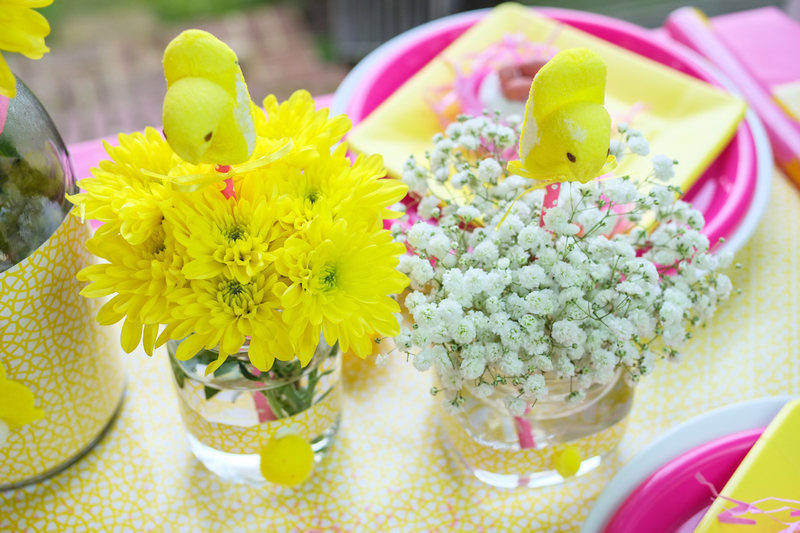 For more Easter inspiration & ideas, hop on over and visit oh so fun Tiffany Fox at Fizzy Party for another under $35 Easter DIY. The aforementioned concepts, product selections, art and designs are the sole creations of Fern & Maple and are provided as a participating member of the Evite Influencer program.